My affection for Valentino Fall 2012, a collection from a brand whose runway bags I often don’t love, seems like part of a wider trend for the season. 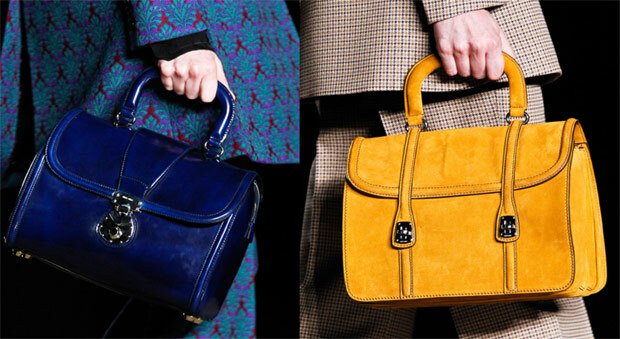 Specifically, if you’re a bag lover, Fall 2012 is going to be chock full of beautiful things for you to lust after and a few that you may actually end up buying and carrying, either for the season for for years afterward. 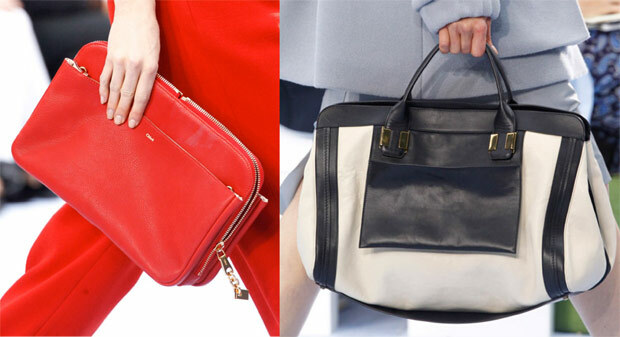 In the three years that I’ve been covering accessories for this site, I can’t remember another season where I saw so many lovely handbag options on the runway. I don’t like to dance on anyone’s grave (sorry, Hannah MacGibbon), but Clare Waight Keller’s second collection as the creative director of Chloe hits it out of the park even harder than the first one did, particularly when it comes to handbags. Looking at the feminine, luxurious, modern leather pieces that Keller’s team conceived for Chloe Fall 2012 makes it nearly impossible to remember the eye-searing catastrophe of MacGibbon’s last collection for the French house only a year ago. Like I said…sorry, Hannah. 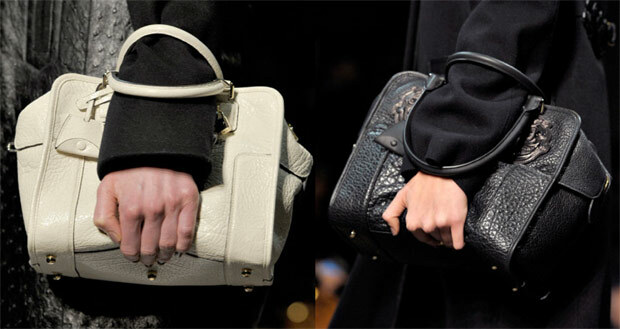 If ever you questioned that Fall 2012 is all about black, look no further than the Loewe Fall 2012 show. Not only was the collection as a whole rooted heavily in every New Yorker’s favorite color, but the bags were almost all inky black leather. 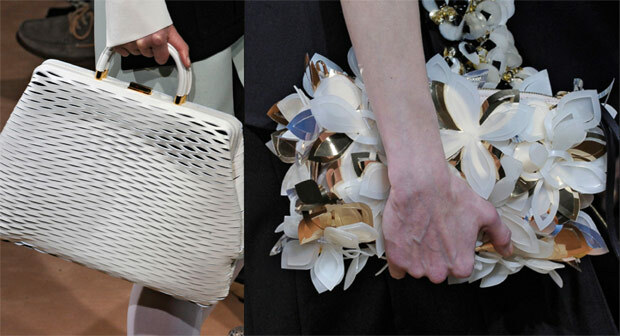 There were peeks of navy, ivory and baby pink here and there, but noir ruled Loewe’s night in Paris. Have you been following along with the endless rumors about who is or who is not going to be replacing John Galliano at Dior? I have, partly because it’s my job and partly because I love a good, public mess, and it would seem that LVMH is no closer to naming a successor than it was the day it dismissed Galliano over his anti-Semitic verbal attacks against patrons at a Paris café. The latest scuttlebutt is that Raf Simons demanded too large of a salary, and that in a rage, Dior CEO Sidney Toledano signed interim designer Bill Gaytten on for six more seasons. At the risk of employing a cliche, I think black might be the new black. The inky color beloved by fashion people and regular folks alike (especially in New York) has been oddly omnipresent in Fall 2012 collections; because it doesn’t photograph well and more vivid colors are preferred for magazine editorials, black often finds itself relegated to a designer’s non-runway line. 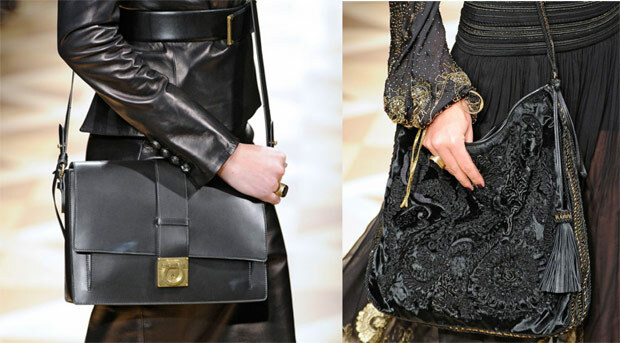 But in Salvatore Ferragamo Fall 2012, among many other shows (Gucci, Versace, Dolce & Gabbana), black takes a starring role. A few days ago, PurseBlog friend BryanBoy tweeted that Marni designer Consuelo Castiglioni would be the perfect replacement for Karl Lagerfeld once he’s ready to move on from Fendi, and I can’t help but completely agree. Marni’s signature retro-minimal approach gets better and more fully realized by the season, and Consuelo’s sense for accessories and embellishment keeps improving right along with it.